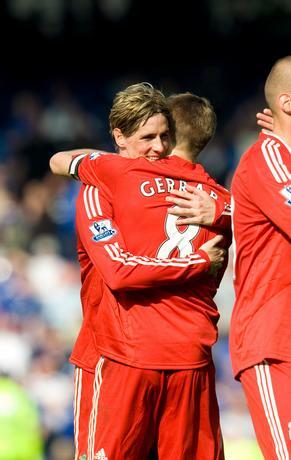 Two goals from Fernando Torres gave Liverpool the deserved win in the 208th Merseyside derby after the poor referee Riley failed to help him in a very physical match. Robbie Keane is still waiting for his first goal in a red shirt, but I think it's vital to give assists for a striker with a clean score-sheet. It's a question of time for him to start firing. Meanwhile Torres stated that he will fire LFC to silverware. Hopefully the team can manage to secure points in the non-prestige matches and avoid dropping them like they did versus Stoke. After the surprising home defeat of Arsenal, LFC is staying behind Chelsea only by difference of goals.